Adolescents account for nearly one-third of the global population. With the incredible amount of physical, cognitive, and psychosocial growth and development occurring during this time, ensuring adolescents’ access to a nutritious diet has life-long benefits. For girls, the impact will echo on much longer, through the survival, health, and well-being of their children. 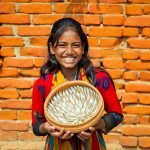 Scaling up Biofortified Crops: Which Ones, Where and When? In 2017 HarvestPlus developed a new, 5-year strategic plan for 2018-2022. The goal of this strategic plan is to establish the key activities and the resources needed for HarvestPlus and its partners to scale up biofortification over the next 5 years, with a vision to reach 1 billion consumers by 2030. Two training workshops were held in January 2018 to develop the capacity of livestock researchers to integrate gender in livestock value chains in projects supported by the Australian Centre for International Agricultural Research in Vietnam, and the United States Agency for International Development in Cambodia. 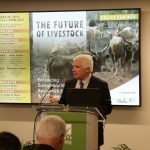 A4NH Director John McDermott served as a panelist at the recent seminar “The Future of Livestock: Enhancing Sustainability, Responsibility, and Efficiency,” held at the International Food Policy Research Institute (IFPRI).